Juniper berries are what give gin its distinctive flavour. Which got us thinking. 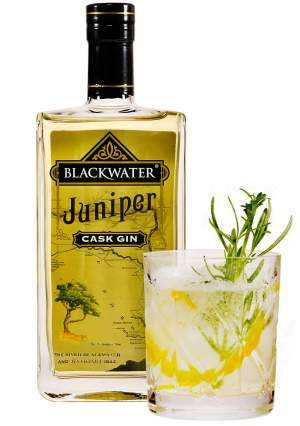 What would happen if you aged gin in a cask made from juniper wood? So we had some juniper barrels made just for us, which wasn’t as easy as it sounds. And as juniper trees aren’t very large, none of our casks hold more than 50 litres which means stocks of this gin are strictly limited. So if you are lucky to come across a bottle of our award winning Juniper Cask Gin, be sure to try it. We use the same 12 botanicals found in Blackwater No.5, but in a slightly different proportion; we push orange and the sweeter roots because, like its berries, juniper timber is, how shall we put it – a wee bit astringent?